Wondering how you can teach a parrot to play basketball? Here's an awesome trick to teach your parrot! This free trick training guide is about how you can train the Birdie Basketball trick to your parrot! Nothing is as exciting as throwing a ball and having your parrot fly to get it and bring it back to dunk it in the basketball hoop! The height on the Birdie Basketball is adjustable so even smaller parrots like a green cheek conure can learn to do this awesome trick. Step 1: Get the Birdie Basketball Set for your parrot from ParrotWizard.com. Step 2: Make sure that your parrot is fetch trained. If it isn't, teach it to fetch before you start teaching the basketball trick. If it is already fetch trained, just do a quick review to remind it what to do. Step 3: Desensitize the parrot to the basketball toy. Most parrots get scared of new stuff. The good news is that the more tricks you teach, the more the bird will get used to accepting new things. The best way to desensitize the bird to the basketball toy is to target it near the toy. Place the basketball hoop toy on a table beforehand. Bring your parrot and set it on the table far from the toy. Get the bird into a rhythm targeting. Target it randomly in different directions and not strictly toward the basketball hoop or it may get suspicious. Target it around randomly but little by little, more and more toward the basketball. Let the parrot pay more attention to the targeting exercise and forget about the basketball until you are able to target it right by the hoop at ease. It is better to take the time to do the desensitization exercise even if the bird didn't get scared than to scare the bird with the toy first and then try to change its mind. Step 4: The Birdie Basketball trick comes with 2 different basketballs. One is a realistic looking basketball and one is a training ball with a lot of holes. For now, put aside the realistic ball and use the easy to grab training ball instead. Give the training ball to your parrot from one hand and then present your other hand and ask it to fetch the ball to your open palm. Using a clicker, click when the bird drops the ball in your hand and give it a treat. Positive reinforcement goes a long way! Step 5: Now it's time to teach the parrot to put the ball in the basketball hoop. Start by lowering the hoop down low. This will not only make it easier for the parrot to reach but also give you more room to hold your hand. Hold your open hand directly over the basketball hoop and ask the bird to fetch the ball. When the bird drops the ball in your hand, click the clicker and give a treat. This teaches the bird to bring the ball toward the basketball hoop. Step 6: Continue having the bird fetch the basketball to your open hand above the hoop, but now pull your hand away just before the bird drops the ball. This way it will accidentally drop it into the basketball hoop when it really just intended to drop it into your hand. Click and reward so that your bird realizes that the goal is to drop the ball into the hoop! Keep practicing and progressively raise the hoop higher and higher so the parrot learns to stretch for a slam dunk. Finally, when the parrot has mastered the basketball trick, you can use the realistic basketball instead. Show the bird the single hole through the ball where it can grab it with its beak and you'll have an NBA allstar in no time! You are thinking of getting a parrot but you don't have any local stores, breeders, or rescues to consider so you turn to the internet. But, the internet is a mine field of scams. How do you find an internet vendor of parrots that will actually deliver a bird to you and isn't trying to scam you? Well, this article is about how to spot parrot scams on the internet! I'm not going to get into how to find a good companion parrot or even the arguments for rescues vs baby birds. I'm going to focus specifically on avoiding internet scams that will run with your money and leave you empty handed entirely. Finding a good breeder or rehoming situation is a whole other topic. Of course the absolute best way to avoid getting scammed online is not to get your parrot online. Any opportunity to find a parrot locally or even going somewhere far to see it in person makes for the highest chance that you won't get scammed. But if you have no choice but to deal with a breeder/seller remotely, here are 10 of the most common signs that a parrot breeder is really a scam! 1. The seller is not knowledgeable about parrots! Presumably a breeder or even someone rehoming their parrot should know some basic things about it. However, if they are talking complete nonsense or have major inconsistencies, it's likely a scam. It starts with the text in the listing talking about an entirely different species than the one depicted. The text appears combined from different sources/writers. Often times, the scammer does not even write the text but just copies it from other websites. If you copy/paste some text from the listing and find it on other sites, it's a scam. Also, keep an eye for similar inconsistencies or copying in the text of emails sent from them as well. 2. They are selling eggs! 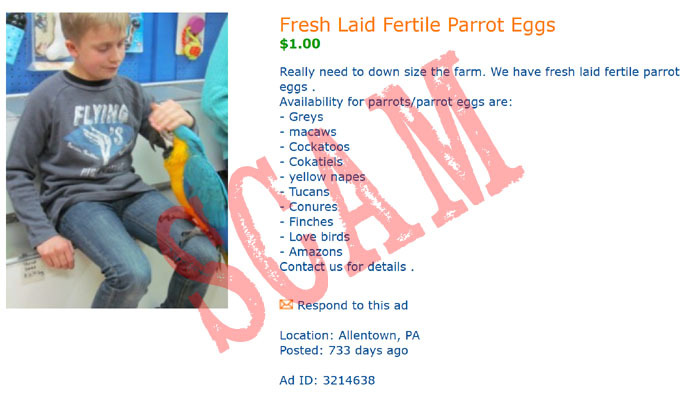 If someone claims to be selling parrot eggs on the internet, they are a scammer! Real parrot breeders sell live birds and not eggs. You cannot buy a parrot egg from someone, have it delivered to you, and pop a parrot out of it. Furthermore, legitimate breeders don't sell eggs that way. Even if you are thinking of purchasing a live baby parrot from a breeder, the presence or claim about selling eggs on their site or listing means it is a scam. 3. Using common pictures off the internet! A real breeder or someone rehoming their parrot should be able to provide an abundance of real pictures of the same bird. Scammers are often so lazy and incompetent that they copy one of the first pictures they find on a google search. Often times, these are pictures of well known celebrity parrots. If you can do a google search and find the same image on other websites, then you are witnessing a scam. The seller should be able to provide you with pictures from different angles of the exact same bird. And if you see any of my parrots in the listing and it is anywhere but my website, it is most certainly a scam! 4. Online communications only! If the seller insists on communicating to you only by email or via the messaging portal on a website, it's totally a scam. Legitimate breeders will talk to you on the phone and you will be able to get a sense of their experience in talking with them. Scammers don't know much about parrots so they can best hide this by cleverly putting together written responses at their leisure. Often times, these responses are copy/pasted responses they had previously written or that they copied entirely off the internet. Most of the scammers are from overseas so they can barely speak English and would not be able to talk to you on the phone. Insist on chatting on the phone before ever committing to an online purchase of a parrot. 5. Rush sale! Parrots are rarely available for immediate purchase from a real breeder. Since the breeding is seasonal, there are many months of the year when the breeder could not sell you a parrot. By the time the breeder has available breeders, they are usually already reserved by buyers from the low season. It is very rare that you can contact a breeder and get a bird immediately. You will usually have to wait for months or even a year for your baby to be laid, hatched, raised, and weaned. 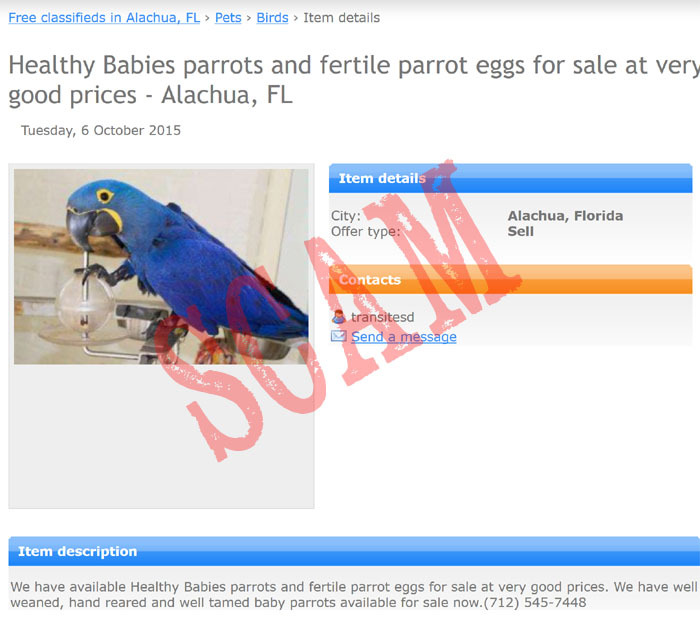 So, if the seller claims immediate availability of baby parrots, be suspicious. If the seller rushes you and tries to get you to make a quick decision and payment, it's a scam. A real breeder will give you time to think and decide about getting a baby and then after a deposit, you will be the one waiting for it to be ready. 6. Fake testimonials! Most real stores, breeders, and sellers of parrots couldn't be bothered to post testimonials on their website. They understand that anyone can post a bunch of fake testimonials on their site and nobody will fall for that. They are too busy raising real birds, because after all this takes a lot of effort, and promote their reputation by their results. You should be able to find mentions of that breeder on public parrot forums, social media, and other places online and not just read fake glowing testimonials on their page. On the other hand, by searching the internet for the seller's name or alias, you might be able to come across others who already mentioned that this seller is a scammer. Ask the seller if they could get one of their past customers to call you and tell you about the baby rearing experience. A scammer surely won't be able to provide that. 7. Worldwide shipping! It's hard enough shipping parrots to new owners around the US. Claiming to ship all over the world is most like a scam, particularly if the breeder doesn't even claim to be located in the US. The cost and complexity of shipping parrots between countries is so high that it isn't worthwhile to most breeders. In fact, the cost would be so much, that you would not end up agreeing to it. However, if someone is trying to convince you that they will ship a parrot to you from another country and it won't cost a crazy high amount of money, it's a scam! 8. Seller is outside the US! 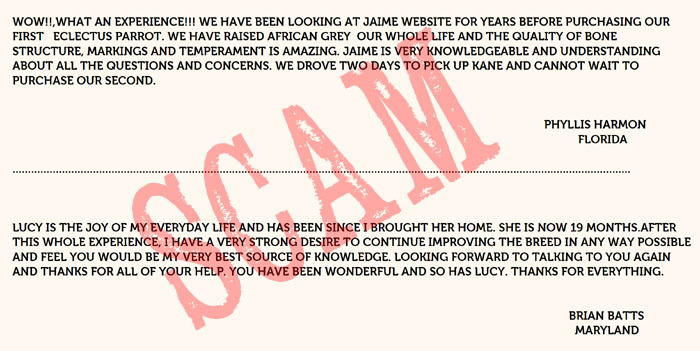 Most, but perhaps not all, of the parrot seller scams originate outside of the US. If the seller claims to be outside the US, don't even go there. If the seller claims to be in the US or does not make it clear where they are located, further investigation is certainly necessary. Try to find out where the seller is. Ask what city they are in. Offer to come and pick up the bird yourself (even if you will end up having it shipped) to see how uncomfortable the seller is with this idea. If the seller absolutely refuses for you to pick the parrot up in person, it is most likely a scam. Check if the business and website domain are registered in the US. If they are not, it is a scam. Poor English, misunderstanding of US geography, and strange time of emails (coming from a remote timezone) are also signs of a foreign scammer. 9. Requiring a money transfer by anonymous means! If the seller requires you to send money via a western union or similar transfer, it is definitely a scam!!! Legitimate sellers will accept or even insist on a personal check, cashiers check, credit card, or paypal payment. These can be traced as well as stopped. There are buyer protections when paying by credit card or paypal. These are useless to a scammer. If you are getting close to the payment part of your negotiations with an online parrot seller, insist on using a payment method like paypal and see their reaction. If they are completely against it, run for the hills cause it's a scam! Gift cards, bitcoin, money orders, and other anonymous payment methods all smell scammy the same way. 10. It sounds too good to be true! If it sounds too good to be true, it probably is too good to be true! If you come across a seller that claims to be selling a parrot species that you know is typically much more expensive, they are probably claiming a low price to trick people into their scam. A typical scam is an offer of a free parrot where you only have to pay for the shipping. Watch out for very exotic/expensive species being offered for cheap. This just doesn't usually happen. There is a pretty high demand for baby parrots so a breeder just isn't going to appear desperate to sell you a bird. If you are offered a cheap, quick, easy, exotic, unbelievable sale on a parrot, it's a scam! So there you go. Ten ways to avoid falling victim to common internet parrot scams. Be smart. Look for clues. Ask unique questions. Take your time! You'll be well on your way to finding a legitimate parrot breeder and get the bird you really paid for. Ever been scammed by a parrot vendor? Leave a comment so that others know scammers to avoid. Looking for a fun and easy trick to teach your parrot? Wondering how you can teach a parrot to bowl? This free trick training guide is about how you can train the Birdie Bowling trick to your parrot! I love the Birdie Bowling trick because it looks a lot more impressive than the effort it takes to teach it. This is a trick that suits virtually all kinds of parrots and is easy to teach (basically everything except budgie, lovebird, or parrotlet because it is too big for them). This was the first prop based trick I ever taught to Kili and I recommend it to people as their first prop trick. Step 1: Get the Birdie Bowling Set for your parrot from ParrotWizard.com. Step 2: Make sure that your parrot is target trained. If it isn't, teach it to target before you start teaching the bowling trick. If it is already target trained, just do a quick review to remind it what to do. Step 3: Desensitize the parrot to the bowling toy. Most parrots get scared of new stuff. The good news is that the more tricks you teach, the more the bird will get used to accepting new things. The best way to desensitize the bird to the bowling toy is to target it near the toy. Place the bowling toy on a table beforehand. Bring your parrot and set it on the table far from the toy. Get the bird into a rhythm targeting. Target it randomly in different directions and not strictly toward the bowling or it may get suspicious. Target it around randomly but little by little, more and more toward the bowling. Let the parrot pay more attention to the targeting exercise and forget about the bowling until you are able to target it right by the bowling at ease. It is better to take the time to do the desensitization exercise even if the bird didn't get scared than to scare the bird with the toy first and then try to change its mind. Step 4: Target the bird toward the bowling ball with your target stick. Set the pins aside for now. Place the ball on the ramp and use the target stick to direct the bird to the ball. Say "target" and when your bird touches the stick, click and reward. After the bird gets good at this, point to the ball with your finger and say "target." The bird should do the same as before but touch the ball instead of the non-existent stick. If it doesn't catch on, keep practicing with the stick some more. Step 5: Get the bird to push the ball. This part is a bit tricky and requires careful scrutiny on your part. Saying "target" and pointing to the ball should get the bird to come to the ball and touch it. But we're not trying to get the bird to just touch it. We want the bird to push it. This is where some clicker training really comes in handy. Using the "target" command, we can get the bird to touch the ball. In the beginning, accept by click/rewarding any touch of the ball. However, as the bird continues to improve, require firmer touches and presses of the ball to receive a click/treat. What you will most likely encounter is the bird getting a bit frustrated when it touched the ball and got nothing, then it will start attacking or shaking the ball in an attempt to get the touch to work (like pushing the dysfunctional elevator door close button a million times). This is your chance to watch for the moment of maximum pushing to click/reward. At some point, the bird will push the ball hard enough that it will roll of the ramp and this is the time to click and give a jackpot reward to mark success. If the bird never overcomes pushing it over the bump, you can try holding the ball just over the bump and encouraging it to push. Let go when it does so that the bird can realize that pushing it to move is what gets the click/treat. Eventually it should learn to push harder and be able to push it on its own. Step 6: Set up the pins, set up the ball, tell your parrot to "bowl," and enjoy! Click the moment the parrot pushes the ball off of the ramp and give a treat. Eventually you won't have to click because the bird will learn that getting the ball rolling is the entire purpose.